Woodhall Spa CC’s First XI played its part in an exciting clash at Louth in the Lincolnshire ECB Premier League as both sides finished on 208. Ross Dixon again took on the captaincy duties following news that club captain Jack Luffman will be out for at least six weeks after sustaining a broken wrist fielding in last Monday’s Grimsby Town Knock-Out victory over the much fancied Cleethorpes. He lost the toss and Woodhall were invited to bat first on a pitch and outfield that lacked pace, and Spa soon found themselves in trouble at 61-5. Luckily the younger element of the side, alongside the experience of the returning coach Paul Timby, stood firm and managed to post a competitive 208-8. This was largely down to a mature and patient innings of 89 from wicket-keeper Jack Timby, who showed his ability and was happy to manoeuvre the ball into gaps in order to build his and the team’s score. He found allies in Henry Wilson (10) and shared in 50 partnerships with Tom Caswell (24) and his dad Paul (32 not out). Spa knew that on the whole it was another below-par batting performance, but felt confident of defending their score. They soon had the home side in trouble at 36-2 then 58-3 with wickets for the impressive Alex King (1-23), skipper Dixon (1-62) and off-spinner Timby, who backed up his batting to eventually claim 4-46 from his 14 overs, bowled in two tight spells. Indeed, it was he alongside Dixon in the middle of the Louth innings that gradually began to swing the game back in Spa’s favour after the home side looked in a good position at 134-3. However, wickets began to fall and it eventually meant that the home side needed seven off the final over with the dependable Joe Irving to bowl it and Louth overseas star Xander Pitchers unbeaten on 76. Irving dismissed him first ball but went for five off his next two, one more followed so it meant Louth needed one from the next two balls to win the game. But Irving kept his nerve and bowled two dots to secure the tie and 13 points for his side. Spa remains firmly in touch with the top three and entertain second-place Grantham on Saturday in a noon start. At home the Seconds hosted their Grantham counterparts and produced an impressive performance to claim the maximum 20 points. After losing the toss on another super batting track and lightening outfield, captain Matthew Sargeant would have been delighted with the efforts of his side with the ball and in the field as they regularly picked up wickets to finally dismiss the victors for 155 in the final over of their innings. All the bowlers used were in no mood to allow the Grantham batsman to settle with Alfie Lindsey, Sam Cherry and the returning Matt Law all claiming a wicket each. But it was evergreen off-spinner Matthew Haslam who was the pick taking 6-18 in miserly spell of bowling. This performance set up the victory and, despite losing three quick wickets around the 100 mark following a half century from Tom Dixon (56), the victory line was reached with some ease with 15 overs to go. Under 14 Ollie Caswell returned to run scoring with an unbeaten 26 and Law too made a significant contribution with an aggressive 35 not out form just 33 balls. Both Wanderers sides were in action on Sunday with a very young First XI travelling to face Lindum while the Second XI hosted the unbeaten Cherry Willingham in a Division One fixture. At Lindum the Premier Division Cup fixture ended in defeat for the Spa men by 63 runs. It was a competitive display from Jack Timby’s men and one in which all players made useful contributions. Batting first the home side were amassed 186-9. James White, Tom Caswell, Henry Wilson and Ross Dixon all claimed a wicket each but it was Alfie Lindsey who was the most destructive, claiming 3-39 from his seven-over spell. In reply, Spa were well placed at 80-3 but four quick wickets for just 11 runs took the sting out of the run chase and, despite a counter attacking 30 from Matt Law, Spa were dismissed for 123. Timby had earlier scored 42. At home, Paul Timby led the Second XI to end exciting three-run victory with himself bowling the final over for just two runs and executing the run out to dismiss Cherry for 210. Earlier Spa had posted 213-7 thanks to an innings galvanising 90 from Jack Hughes. He was well backed up with cameos of 20 from Nathan Carter and Timby as well as an encouraging 32 from young under 16 debutant Matthew Ashford. In the field, Spa’s young guns kept to their tasks well under Timby’s experience. 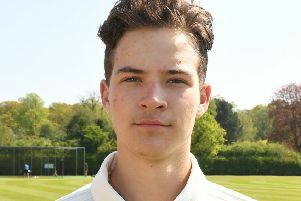 Young off-spinner Oliver Hausermann again impressed taking a wicket tin his five over spell and Kieran Richardson returned to wicket taking action taking 3-29 from his seven overs. All in all it was a great advert for cricket with both sides playing to win in the right manner and it was fitting the result went down to the wire.